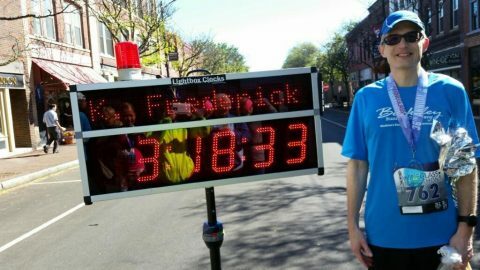 Kris Frederick Gets BQ + 13 Minute PR | Run S.M.A.R.T. Janet was very interested in making sure that I understood the workouts and kept encouraging me throughout the training. The best part about the training program was that I could see it building and could tell that I was getting stronger, which gave me confidence that I could perform on race day. By following the plan, I was able to run faster than predicted, not only breaking my marathon PR by 13-minutes, but also besting the Boston Qualifying standard by 6.5 minutes.